1978’s The Running Man was a film that was overhyped for me and probably led to my initial bitter taste from viewing it. Watching now, months later, that bitterness hasn’t left. It’s not a strong bitterness, more like a fair steak that’s been salted just a tad too much and has minutely spoiled the original delicacy. For once, though, let me start by saying how impressed I still am with The Running Man. 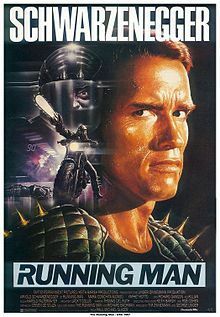 Another film adaptation of a Stephen King novel (which he wrote under a pseudonym) that is finely written, no doubt thanks to King himself, The Running Man takes all we know and upends it, declaring, “What if everything we know is a lie?” It’s a scary thought to think. What if everything reported by the news was a fabric of imagination, a cloth of deceit covered by fine china? How far away from that are we? A couple of people lie, set a trend and suddenly a news station or publication might consider doing the same to keep pace. I’ve always been fascinated by science fiction and dystopian literature. The morals or lack thereof and the fears these novelists play upon are in some cases entirely plausible, making one reach an epiphany of recognition, a moment of, “Oh my gosh, this could be a thing” and reading or in this case, watching, as man, left to their own devices, tear the world as we know it apart. The mob mentality is an overwhelming force, one people have reason to fear because soon you might be the only one who seems sane. These are but a few dystopian themes and some are at play here in Paul Michael Glaser’s film. The set-up for this film is crude. Remove a few opening lines pasted on the screen and there’s no real explanation as to where we are or why we’re there. Schwarzenegger’s Ben Richards is in a helicopter and important plot points are occurring. It’s not necessary to have a lead into a dystopian film. I would argue in some cases it would be more appropriate to throw us into the action right from the get-go. The indecisiveness of throwing words on a screen coupled with immediate action draws the image of someone throwing their note cards for their presentation up in the air, gathering them up in some random order and presenting. Introductory goofs aside, The Running Man‘s a solid enough story to make it worthy of the translation from print to screen. Ben Richards is a good character, I guess. I don’t really know because Schwarzenegger’s characterization is vague. I blame the writing more than Schwarzenegger here because not even the dialogue speaks to any true identity. He’s an engine for the film, but knowing King’s work, I’m assured there’s more to Ben Richards than this film suggests. Richards is a framed criminal placed into a gladiatorial death race, cameras watching his every move for a live television audience. It’s the number one show in the world. People are cheering for criminals to be brutally murdered on live television. Judge, jury and executioner, awarded to viewers by a TV show that is all too eager to grant them the privilege. How far is UFC from that? How far are we as a society from that? Those are the questions King serves by proxy here. Dystopian societies are a fiction now, but a possibility later. With theoretical dissemination aside, the story is rather raw. Richards is left untapped, the side characters are adornments, not centerpieces and Richard Dawson, who leads in both performance and character, doesn’t get as much space as I’d like. The third act is too nice, considering the revolution taking place. Far too neat. My score for The Running Man: 78. A strong theme with a so-so story, Schwarzenegger’s endless puns, action sequences and tempo contrasts are enough to give this a solid 70’s score. A healthy dose of disappointment with pleasure.